We hopped on the bus and headed for Richmond. We drove by the Benjamin Franklin center on our way, just to round out our National Treasure experience (we've now been to most of the places from the movie...and will not have to watch it next year!). Look how precious. Aw, Amanda and Vince! In all seriousness, it's awesome to me that a married couple would subject themselves to this nonsense. They really have a heart for the youth (as do Cindy and Paul, who you've no doubt noticed are not with us this year because of work commitments. Have no fear; they'll be back). Another common sight: finding odd ways to catch a nap. I know you've always wondered what we do on the bus before we go in. Wonder no more. Katherine picks up all the cell phones from the kids. She keeps them with her in the bag. Assuring them their phones are safe is the only way you can pry them out of their hands...but it does keep them more engaged in the concert and (more importantly) the visiting afterward. When we arrive, I take Mitch, one chaperone, and one youth with me to scope out the venue. Mitch and I figure out where we'll sing and what equipment we need. Then we send the chaperone (Curt this year) and the youth (Adrian this year) out to bring the youth and equipment in, and the youth lines up the choir. Here are Adrian and Curt about to hope off the bus. We've sung at this venue before, but last time we sang down in the social hall. The chapel was a little warm, but the sound was fantastic. The choir really sang to their potential. A solid concert from beginning to end. Easily the best of the week. They sounded like I hope they will on Sunday when we sing our homecoming concert at 11:00am in the sanctuary of DFUMC, your chance to hear what we sound like after a week of singing concerts. This is a not-very-subtle hint, folks. I realized I haven't put many action shots of the youth singing, so I thought I would drop a few in here. Watching them sing when they are really engaged (as well as interacting with them) is one of my favorite parts of the concerts. Wrapping up our concerts, in total we sang for almost 400 people. And, in another tour first, we also sang for one dog. Not bad for six venues! That's 400 people who have experienced the love of Christ. 400 people who may walk just a bit taller today. One small corner of our world made better. We checked in to the hotel and then headed out for a baseball game. The home team in Richmond is the Richmond Flying Squirrels. It seems Andrew and Jerry purchased flying squirrels costumes online a few days ago and had them shipped to our hotel. I think they were hoping to get on the jumbotron or something. Maybe I should have told him the ballpark had no broadcast cameras of any kind... Nah. It was pretty funny, though. When the male and female mascots (Nutzy and Natasha) came out, they yelled, "Mom! Dad! Why won't you pay attention to us?" I may have paraphrased that. Still, I've never had youth costume to match the mascots when we've gone to a game. Marshall joined us for the game. And gosh, Nathan, that's a nice shirt. The game was a lot of fun. Steven's in the picture below wearing green. It was his birthday! So we had them announce his special day! Woo! Happy birthday, Steven! They weren't bluffing. They wore the costumes to the game, and they went nuts. Which I think was the idea, since that was the mascot. A ball autographed by the player of his choice. A wicked awesome looking injury. Several other small items from the team. A great story to tell every year from now until he graduates (and even beyond). A great way to woo the women (because who doesn't love a good injury story). What I mean is, I'm glad he's ok. Speaking of baseballs, Marshall wound up getting one. 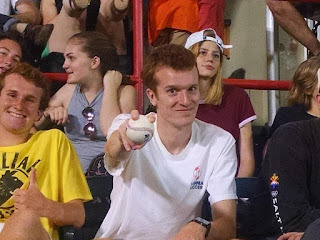 If you've followed us in the past, you may remember that last time we went to a minor league game, in Charlotte, he got a ball at that game as well. That was pretty great. I feel confident Olivia will be jealous when she sees this. The weirdness just keeps coming. They cancelled the fireworks after the game because of inbound severe weather. We got on the bus just before the bottom really fell out. And once it did...yikes. Made me think of "Hold On" ("Noah, Noah, let me come in!"). If you're wondering what that is, it's a tree in the middle of the road blocking both of our travel lanes. Mark (our bus driver who has pretty much won our hearts this week) didn't even hesitate. This was too big for Curt and Tait to get out and move (which is our default action when there is an obstruction). In yet another tour first, he took the bus off-road, crossed the median, drove on the wrong side of the road for a moment, and then crossed back. It. Was. Awesome. So cool, calm, and collected. We got back to the hotel still under warning, so we gathered on the first floor inner hall and waited it out. Once the danger had passed, I handed out thankyou notes, and we finished those up. You'll notice in the picture those are the emergency lights in the hallway. 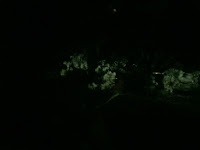 Did I mention that the power was out at the hotel when we got there? And did I mention that the power didn't come back on until...well, it had not come on when we left this morning! The youth did a fantastic job with all this. They followed directions and made the best of a challenging situation (you can imagine with no air conditioning this hallway wasn't the most comfortable place). I'm sitting on the bus on Friday morning now, heading toward home. We have more to do today, and I'll post that for tomorrow. But I'll leave you with an email I received from one of our hotels just now. "I just wanted to sincerely thank you for having your students stay with us this week. They were truly amazing and well mannered. We had serval staff and in house guests compliment how well behaved they are." Wow! It took two cups of coffee to get through all of Thursday's adventures! Isn't it AWESOME (the word of the decade) to accompany a group like this? To get an email from a hotel praising their behavior! So proud of you all and looking forward to seeing and hearing you on Sunday. Bummed to have missed you this year! I'm sorry too that you got to experience some of our summer weather! Hope to catch you next time! This is your cousin Lauren by the way!